‘Twas the night before Christmas, 1943, and the crew at radio station WOV in Newark, New Jersey are assembled to broadcast a special treat for their war-time audience. Station manager Clifton Feddington (Shawn Rogers) has hired the well-known actor William St. Claire (Tim Blough) to join the Feddington Players as Scrooge for an on-air presentation of A Christmas Carol. 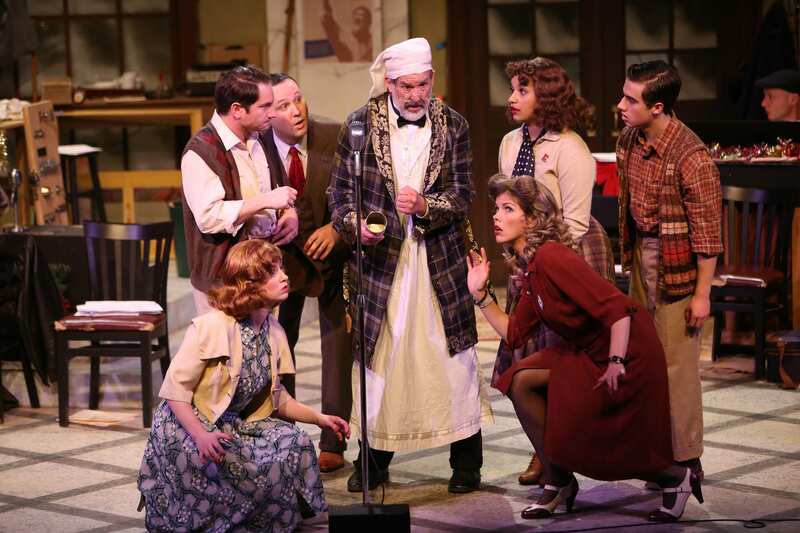 Broadway Rose Theatre Company presents the festive comedy A 1940s Radio Christmas Carol. Written by David Wohl, Faye Greenberg, and Walton Jones, this is the final production in Broadway Rose’s Season of Irresistible Fun. And fun it is, as this on-air play quickly spirals out of control. The station has just moved from Manhattan to Newark and nobody is happy about it. Things happen, toilets flush, and in a period of wartime chaos and uncertainty, there is the feeling of barely getting by. Nevertheless, in the spirit of thespians hundreds of years before them, the troupe carries on. The hardy souls of WOV step up to the mics to deliver spirited performances complete with interesting and comical special effects, some wonderful a cappella holiday tunes directed by Toots Navarre (musical director Jeffrey Childs), and a lot of laughs. It’s just a good thing that 1940s listening audience can’t see what’s really going on! Broadway Rose’s production is directed and choreographed by Dan Murphy, with music direction from Jeffrey Childs. The creative team includes Robert Vaughn (Set Designer), Sarah Marguier (Costume Designer), Jane Holmes (Wig Designer), Phil McBeth (Lighting Designer), Brian Moen and Sharath Patel (Sound Designers), Emily Wilken (Prop Designer), and Jessica Junor (Production Stage Manager). A 1940s Radio Christmas Carol runs through December 23 at the Broadway Rose New Theatre, 12850 SW Grant Avenue, Tigard, Oregon. It’s a wonderful kick-off to the holiday season, and is suitable for all audiences. Photo: Clockwise from bottom left–Malia Tippets, Jared Mack, Joe Theissen, Tim Blough, Jade Tate, Jackson Wells, and Sarah Maines, with Jeffrey Childs, background. Not shown: Shawn Rogers and William Shindler. Photo by Sam Ortega.